We see a tiny pier sticking diagonally out into the ocean. Some boys scamper along it and leap in, then they make their way through the surf back to shore so that they may repeat the game. That is all. 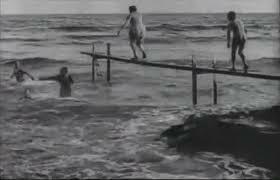 These few seconds of footage represent what is undeniably the first Beach Party Movie, and my contribution to the Beach Party Blogathon, being hosted by Speakeasy and Silver Screenings. I giggled a bit when I first signed up, wondering if I was “cheating” by picking a movie that was less than a minute long, but now I feel a certain obligation to expand on the theme, given that I am talking about the earliest movie in this Blogathon. The movie is short, and it was among the first films ever to be projected before a paying audience. It was shot by Louis Lumière, on the coast of France, probably in the Summer of 1895, while the Lumières were perfecting their “cinematograph” – a device that both shot and projected moving pictures. Along with better known movies, like “Workers Leaving the Factory,” “A Train Coming into a Station,” and “The Sprinkler Sprinkled,” it was shown to a live audience on December 28, 1895, the date that many use to mark the birth of “cinema.” I’m sure that the subject was chosen to emphasize movement. What was significant about this performance is that it was not simply a projection of still images of slides, as with a Magic Lantern. 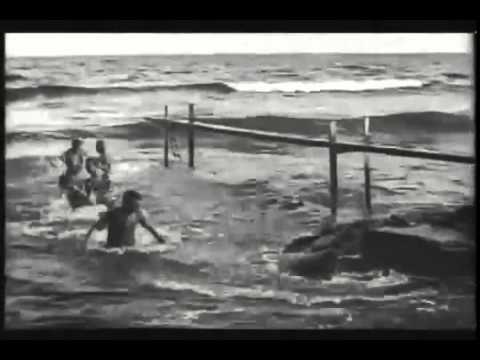 Each shot was chosen to emphasize the “motion” aspect of “motion pictures.” In this case, the kids playing are complemented by the constant roll of the waves, which fill much of the screen. Whereas Edison’s kinetoscope experiments, and later movies, were shot in the cramped quarters of the Black Maria, the Lumiere’s ventured outside (the cinematograph was far more portable), and used the natural landscape as the setting for this movie. I said that the figures we see are boys, and the first impression is that they are, but actually the images are so blurred that it’s hard to say for certain. 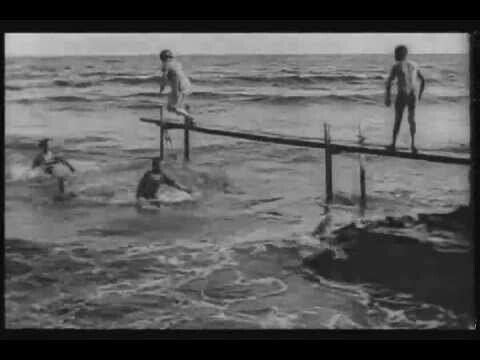 The fourth person who jumps from the jetty seems to be an older girl or woman, to judge by her shape. It’s hard to tell, also whether they are wearing bathing suits or street clothes (and bathing suits were much larger in the nineteenth century, even in liberal France), but it looks to me as if some of the kids have shoes on. While it’s hard to make out the details, what does come across is the sense of play. These figures are not “exercising,” they are not competing in a diving competition, they are having fun for its own sake – jumping into the water for the thrill of it, then bounding back up the beach to experience it once again. It may be because it’s very hot here where I live right now, but it looks to me like a joyous release on a hot summer day. We’ll be reading a lot about different kinds of beach party movies over the next few days, and they will all have very different themes and ideas behind them. But, I think there are two parts that will be common to all. First, the sea is a very photogenic subject, as Louis Lumière realized first. It moves without being asked, it draws the eye and inspires memories and romance. And second, I think all of these movies will have something of that element of play. Oh, I realize that the classic Beach Party films were more focused on the “coming-of-age” and teenage angst and all of that, but, really, the significant thing is that they were always set during summer break, a time when the young people escaped the rigid conformity of school and the supervision of parents to indulge in having fun. That was also something Lumière hit upon, now nearly 120 years ago. Everyone have fun this summer. Alternate Titles: Baignade en mer, The Sea, Bathing in the Sea. This sounds magical. Interesting to see that the ‘beach’ has been an inspiration for directors since the beginning. Perhaps it has something to do with the freedom that’s associated with visiting the sea. Thanks for the comment! I think there are probably a lot of reasons that people (and filmmakers) are drawn to the sea, and some of them are surely cultural or individual in nature, but it’s interesting how common and trans-national it seems to be. I really like your comments about the appeal of beach movies, so well put and thank you for including this early example in the blogathon. Thanks for your comment and for hosting the blogathon! It’s been interesting to see the different directions people have taken this, I hope my approach was a useful one. I love this!! I love that these are a bunch of kids jumping into the water. They make it look like so much fun – especially the kid who does the fancy somersault dive – that I want to run and join them. 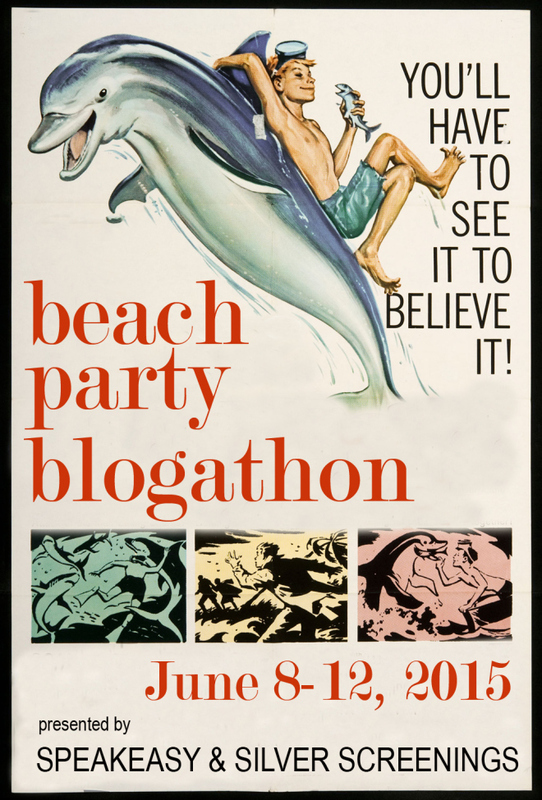 Thanks for coming to the Beach Party Blogathon with this early gem, truly the first Beach Party movie! Ha! Missed this when it was posted. Thanks for the comment and the chance to participate!